We came to Big Junction after entering Graham County, North Carolina. Is any place on earth more beautiful? 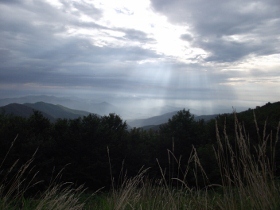 Here are a few photos from the overlook on the Cherohala Skyway. As you can see in the photo the elevation is 5,235 feet. This still puts us close to a mile high. 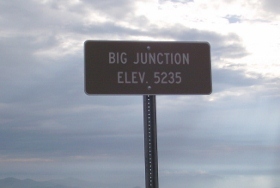 We found Big Junction on our Etowah to Etowah in six hours loop. You can see why we are already looking forward to driving the Cherohala Skyway again. The overlook is as peaceful as it is scenic. It's almost like you can see forever. The town of Robbinsville, North Carolina is about 10 miles from here and has a drive time of about 30 minutes. It is also the home of the next gas station. The Cherohala Skyway is the most expensive road in the history of North Carolina. It took more than 30 years to complete and is estimated to have cost $100 million dollars to build. As I looked over the Appalachian Mountains from the overlook I could see why. That a road could be built through here at all is a huge engineering feat. Our previous pause was at the Unicoi Crest overlook. This put us over 4,000 feet straight up. Views from both overlooks are tremendous. The next portion of our journey took us into the small town of Robbinsville, North Carolina.